IAPMO cUPC® listed, File number 4951, and meets both the UPC and IPC plumbing codes. ASTM B88 Tube Types – K, L, M drawn (hard) copper tube from 1/2″ to 2″ and annealed (soft) copper tube in 1/2″ to 1 1/4″ Nominal Sizes. PEX water tube that meets the requirements of ASTM F876, F877 using a tube liner as provided by EPC. Approved Applications – Potable water, hot water heating, chilled water systems within the pressure – temperature rating stated below. Other applications? Contact a CB Supplies representative for application specific information. Note – plumbing systems must be in installed in compliance with local plumbing codes. CB Supplies is proud to partner with Elkhart Products Corporation in bringing QTite fittings to Canada. QTite fittings provide a clean and easy joining method that’s designed to save time and money on installations. Installing a joint with QTite is simple, requiring no extra materials beyond the QTite fitting for copper and CPVC tubing installations, and a QTite fitting plus a tube liner for PEX installations. No more solder, flux, heat or special pressing tools needed! The result: lower costs, reduced labor time, and a clean and efficient installation process! 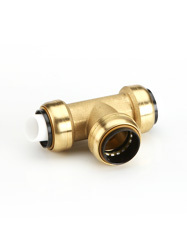 QTite fittings are perfect for hot and cold water services and chilled water applications. Like all Elkhart Products Corporation copper pipe fitting products, QTite fittings are designed and manufactured with the highest quality possible. QTite fittings go above and beyond to meet the latest industry standards. QTite fittings are manufactured from copper or copper alloys and use EPDM o-ring seals. These fittings are designed to join Copper and CPVC tube in the 1/2″ to 2″ size range, and PEX tubing in the 1/2″ to 1″ size range (requires a tube liner). Operating temperatures are from 0° to 250°F at a maximum working pressure of 200 psi. QTite fittings carry a 50-year-warranty against manufacturing defects. Contact an EPC representative for details. All warranties are subject to following good installation practices. The installation manual provides comprehensive details. For more product information, please visit www.elkhartproducts.com.